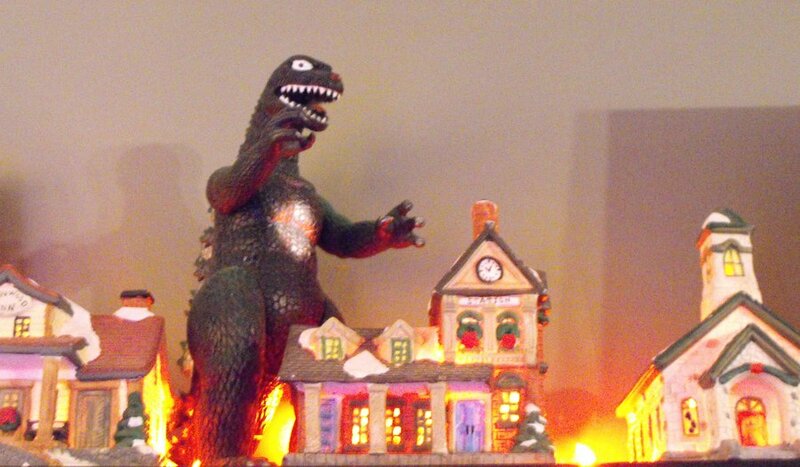 Ever look around your house during the holidays and think “I really miss my Halloween decorations. If only I could celebrate Halloween and Christmas at the same time!” Well, I’m here to tell you that not only can you do it, but it’s easier than you think! So how can you keep the Halloween spirit going at such a cheerful time of year? There’s always the passive/aggressive approach – never getting around to taking down your favorite Halloween stuff. This saves time and is guaranteed to annoy traditionalists. 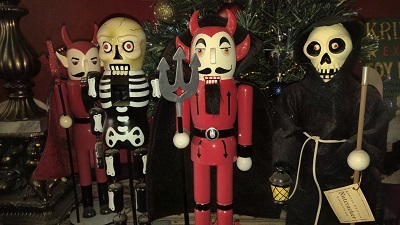 For example, I display my ghoulish nutcrackers (devils, skeletons, Grim Reaper, etc.) 12 months a year. I have a life-size skeleton named Vincent who lives next to my TV. During the Christmas season, he’s sporting Santa gear, and Zero, his bony canine companion has reindeer antlers. Likewise, my Nightmare Before Christmas collections are out on my shelves all year. Another even more flamboyant way to express your love of Halloween at this time of year is to do a Halloween tree. 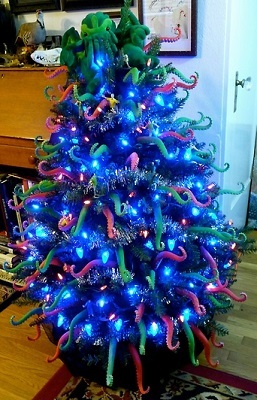 O Cthulhu Tree, O Cthulhu Tree, R’lyeh Fhtagn! 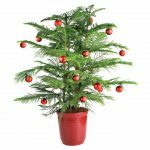 You can still have your traditional live or artificial pine Christmas tree with spooky Halloween ornaments and some of your favorite Halloween items you already have subversively mingled in amongst the angels and snowmen. Or you can have the best of both worlds and set up a separate tree dedicated exclusively to your own Halloween, Horror, or Gothic themes. Personally, I do both. I have a traditional Christmas tree with all the usual decorations. But I also believe you can’t have too many trees. So I also like to do small themed trees. 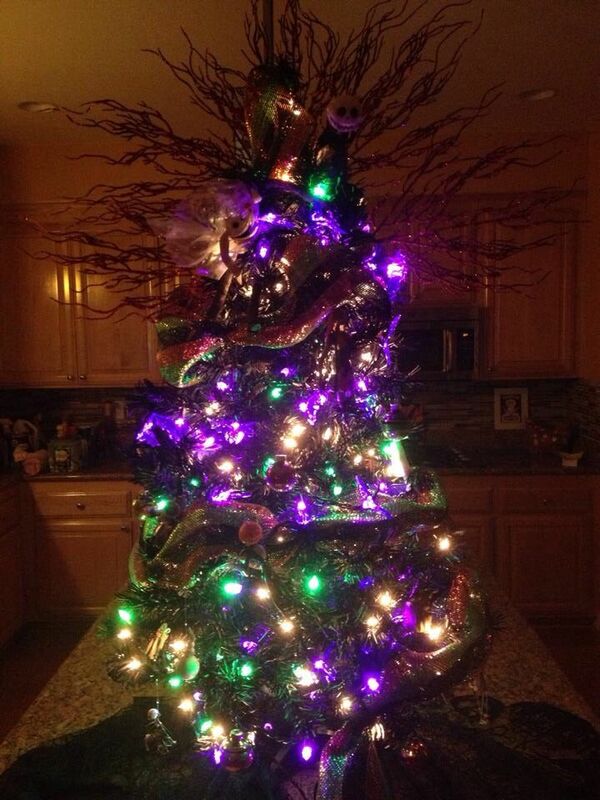 This year, I have a Cthulhu tree, and next year I want to add a separate tree with a simple black and purple theme. What kind of tree do you want? Traditional pine? Fresh or artificial? A full-size tree, mini tree, feather tree, or maybe even a bare tree? 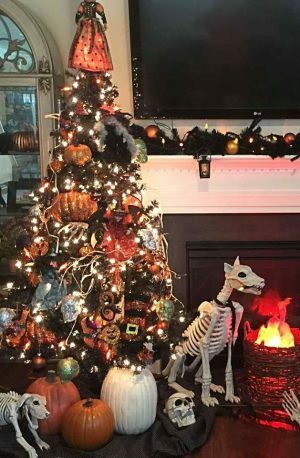 You can build your Halloween tree from a traditional Christmas real or faux pine tree, a novelty black and/or white tree, or a skeleton tree or feather tree that you use for Halloween. The kind of tree you select may depend upon what kind of ornaments and other decorations you want to use. Remember, Halloween isn’t just orange and black anymore. In fact, green and purple are the new orange and black. Check out craft stores for sparkly, silky, or shiny ribbon in these colors as well as white and silver. Look for bead garlands in purple or green. You can also repurpose your Halloween garlands, beads, or ribbons to deck out your tree. Hint: Mardi Gras beads come in just about every Halloween-friendly color and can be ordered any time of year. Best case scenario: You already have strings of light in Halloween colors. Or you were smart and stocked up at post-Halloween clearance sales! If not, Christmas lights are available in single-color strands, so look for purple, orange, or green lights or even plain white lights. Go wild with ornaments! 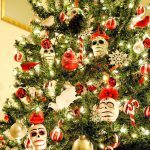 Check out the Morbid Emporium for cool Nightmare Before Christmas, Day of the Dead, monster ornaments from Horrornaments, and more! You can also repurpose small toys and knick knacks as ornaments by hanging them from the tree with clear fishing line. I have some Godzilla figures and tiny scary snowglobes that I’ve been hanging on my tree for years. Day of the Dead ornaments are everywhere these days, especially sugar skulls. 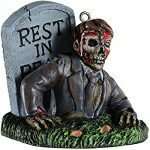 Check out online stores for “Halloween ornaments.” Online retailers have them in their warehouses all year round. 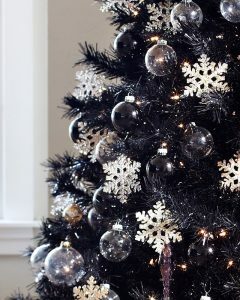 If you’re creating a tree themed by color, look for black (not so easy), orange, green, purple, and white. You can also spray paint plain glass ornaments yourself to get exactly the look and colors you want. If you can’t find what you’re looking for in a typical Christmas store, you might try your hand at some DIY ornaments from the craft store. Also, Martha Stewart’s website is full of great ideas for Halloween stuff. Looking for amazing ornaments for your tree? Click here to explore the Morbid Emporium! Euro-Krampus – A tree with folkloric décor and figures of Krampus and his friends, sacks, bundles of sticks, horns, musical instruments, and so on. Make sure to include traditional European “Saint Nicholas” figures. Nightmare Before Christmas – A black or white tree or a pine with black, white, and purple decor and of course, plenty of Nightmare Before Christmas ornaments. Steampunk – An old-fashioned pine tree, of course, decorated with airships, gears, top hats, old photos, goggles, and various Victorian accoutrements. 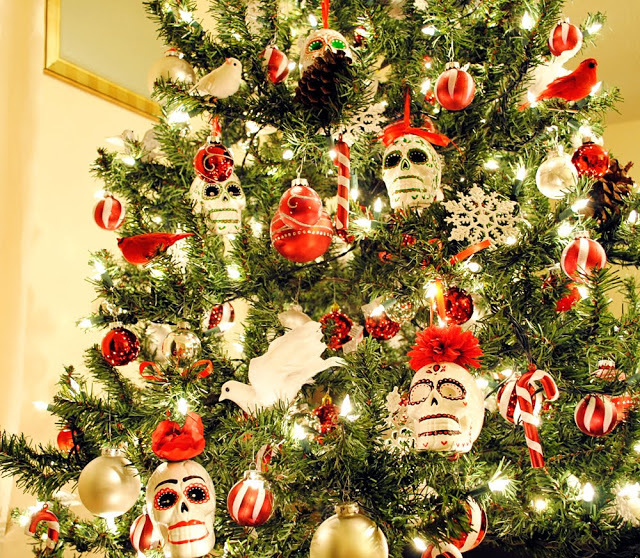 Skulls and Bones – Deck out your entire tree with a skulls and skeletons theme. In addition to “human” bones, you can also add plastic small animal skeletons like skeletal ravens, rats, and bats. Dia de los Muertos – Super colorful! Big, bright solid-color bulbs can fill in between skulls and skeletons, flowers, birds, guitars, and other Day-of-the-Dead imagery. Vintage Halloween – A feather tree covered with reproduction Beistle Halloween paper decorations. Movie Monsters – Werewolves, vampires, zombies… you know, the classics! Or go with a more modern theme using hockey masks, chainsaws, and knives. Swaddle the base of your tree in black, white, or color-coordinated gauze or crepe or perhaps some other fabric that looks good with your decorations. Or just repurpose a woven throw or blanket. I like to mix it up with my Victorian Christmas village under the tree, so that the teeny tiny ice cream parlor and train station are right up next to a haunted house, a funeral parlor, and a mad doctor’s lab. And I always make sure Godzilla is invited! A whole tree is too much, you say? Never fear! 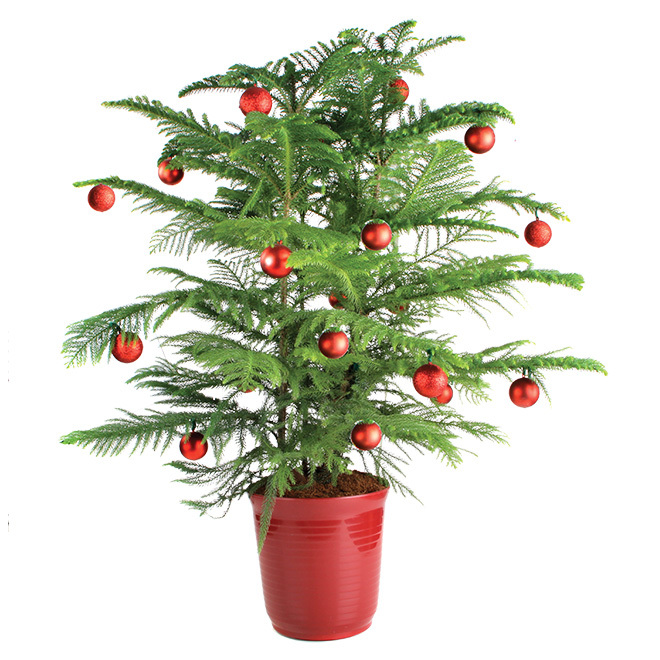 You can still do it up on a small scale – even a simple pine garland or a potted Norfolk Island Pine can be jazzed up for a Scary Christmas with minimal effort and beautiful results.